Atlus announced it's bringing a refurbed version of card-based strategy RPG Yggdra Union, originally released on GBA, to PSP on September 16th. According to the publisher, this version remasters the visuals and audio, adds voice dialogue in Japanese and English, plus the all-important widescreen aspect ratio. The gameplay sounds a little bit real-time action and a little bit turn-based strategy, with a card combat system. Full release follows the jump. Atlus U.S.A., Inc., today announced Yggdra Union, a card-based strategy RPG for the PlayStation®Portable system (PSP). For years, strategy RPG fans have accepted repetitive, non-interactive battle sequences as the genre standard; few games have dared to break the mold. Yggdra Union blows through, shattering the mold into tiny, unrecognizable bits. One reviewer wrote of the game's ground-breaking mechanics, "It's no easy feat to invigorate a genre that has remained fairly set in its ways for the last few generations, let alone do it with the imagination and energy present here. "* Experience a fresh mix of turn-based strategy and real-time action, constantly engaging the player and providing intense, riveting gameplay combined with tactical card-based combat. 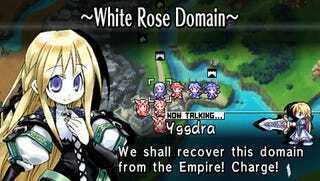 Originally released for Game Boy Advance to warm praise, Yggdra Union is beautifully remade and loaded with enhancements, including fully remastered audio and visuals (featuring the artwork of famed character designer and manga artist Satoko Kiyuzuki), dual language voiceovers in both Japanese and English, a widescreen aspect ratio, additional difficulty settings, new unlockable content, and more… all exclusive to the PSP® system! Yggdra Union is currently scheduled for release on September 16.